Tickets from just £14.50!Here’s a very, merry, special deal for all of you that have seen the show before! You enjoyed it the first time round, enjoy it even more again! Try a different location or even the same one that you visited before. It’s 50% off – you can’t go too overboard with this one, take all your friends for an amazing night out and spend what you save on Booze!! (Do drink responsibly though… lol). Just call the booking line on 01273 41 77 87 or use our Christmas 2011 Code “XMAS2011” for booking online – secure your places at any of our venues until the end of the year – even our very special Christmas shows. What a great idea for your office party – everyone will love you for organising an Adonis Christmas this year! We hope to be entertaining you all again in the not too distant future. Just £14.50 p.p. – phone bookings only & no booking fee on these dates! Tickets are subject to a £1.20 booking fee, minimum booking of 4, and are subject to availability, tickets available until the end of 2011, Adonis Cabaret Ltd. reserves the right to withdraw offers at any time. 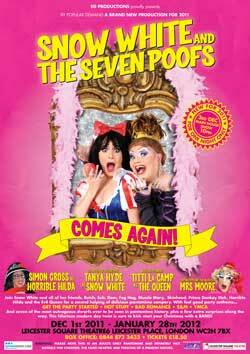 Looking for an Adult alternative to Panto this Christmas? 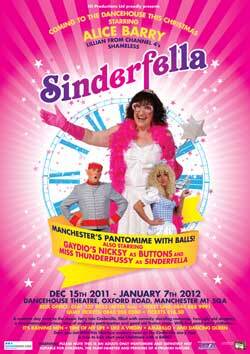 Sinderfella is coming to Manchester this December and stars our very own Miss Thunderpussy. Alternatively, in London you can catch Snow White and the Seven Poofs.